The completely wireless earphones include an upgraded linear piston driver that can deliver powerful sound with minimal distortion in a small unit. Fit is also a priority, and in addition to the redesigned, adjustable earhook, Powerbeats Pro come with four ear tips of different sizes. You can expect up to nine hours of listening time from a full charge, and the Fast Fuel charging system delivers 90 minutes of playback after five minutes of charging and up to 4.5 hours after 15 minutes of charging. 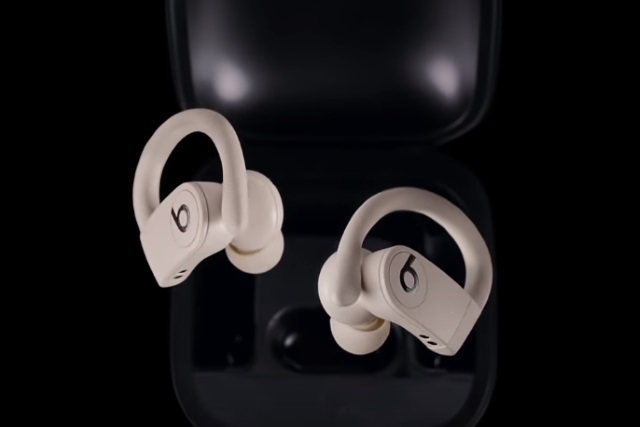 Powerbeats Pro is a harmonious blend of premium sound, fit and functionality. Powerbeats are already the #1 fitness headphones in the world and they are now untethered, with all the benefits of the Apple H1 chip. No longer do you have to choose between performance and practicality -- it delivers the best on both fronts. The earphones have Siri support, and are water and sweat resistant. Beats says of them: "No power button means no worries. Powerbeats Pro earphones power on when taken out of the case and power off (and charge) when placed inside. Motion accelerometers detect when the earphones are idle and not in use, automatically entering them into sleep mode". Powerbeats Pro will be available from May for $249.95. Find out more on the Beats by Dre website.